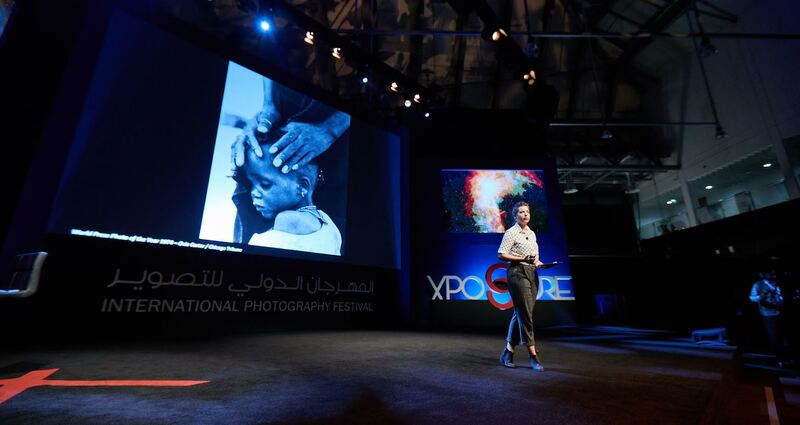 Sharjah-UAE: Poignant visual narratives on human conditions defined the agenda of the second day’s seminars and workshops at XPOSURE 2016, first International Photography Festival being hosted by Sharjah Media Centre (SMC) under the patronage of His Highness Sheikh Dr Sultan bin Mohamed Al Qasimi, Supreme Council Member and Ruler of Sharjah. Two-time Pulitzer Prize winner Muhammed Muheisen provided a fitting prelude to the moving session titled Telling Their Stories that portrayed how, in any conflict, children are the most vulnerable. The seminar compelled the audience to take a closer look at the lives of refugee children and contemplate how they carry on with their lives despite the grief and upheavals of war. Almond Garden by Polish-Canadian photographer Gabriela Maj also highlighted human suffering and endurance through a collection of portraits and documented stories from inside several women’s prisons in Afghanistan. Underlining the important role of photography as a medium for social justice, the seminar cleverly interspersed images of the corruption and abuse that permeate the Afghan prison system. The day commenced with a keynote presentation titled Desert Air by celebrated National Geographic photographer George Steinmetz – best known for his exploration and science photography. Steinmetz presented a small preview selection of his works that is set to appear in his next compilation – an eponymous work documenting the world’s most arid regions across a 15-year period. The book is set to serve as a revelation of the few remaining secrets in our world today – seamlessly traversing remote deserts, obscure cultures and new developments in science and technology. World Press Photo – The Power of Photography, an educational seminar hosted by Anaïs Conijn, Exhibitions Manager and Curator at World Press Photo, examined the impact of the craft and shared Conijn’s curatorial outlook on the future of photojournalism and documentary photography. In a seminar titled The Explorers, two highly accomplished and respected photographers Beno Saradzic and Eddii Keogh, members of Canon Professional Network and experts in different genres of photography, talked about their individual experiences and specialisations. A Small World, hosted by Alberto Ghizzi Panizza, offered a sneak peek into the magnified world of macro photography. Recognised as one of the best macro and landscape photographers of Italy, Panizza’s work has featured in publications across the world. Vineet Vohra’s Harmony in Chaos offered a discussion on how to maintain harmony in the face of chaos. A veteran street photographer, Vohra shared his thoughts on maintaining honesty through his lens, given the arbitrary nature of life. Eaternal Zest by award-winning food photographer and writer Drina Cabral, on the other hand, elaborated on achieving a harmonious relationship between art, design and visual appetite. In his seminar Day to Night, Stephen Wilkes, one of America’s most iconic photographers, spoke about his most defining project of the same name. Day to Night portrays epic cityscapes and landscapes from a fixed camera angle, capturing fleeting moments of humanity. The day ended with a conversation between Don McCullin, one of the 20th century’s greatest photographers, and Aidan Sullivan, a world-renowned lens man, picture editor and Honorary Fellow of the Royal Photographic Society. They discussed Irreconcilable Truths, McCullin’s three-book series which features 700 of his most iconic photographs and previously unpublished images. Workshops ranging from reasonably priced beginner level sessions to masterclasses with established experts also formed part of the day’s proceedings. Painting with Light, a seven-hour course led by Andrea Belluso, who has earned the sobriquet of the Light Shaper, involved creating and taking four different shots starting with a single source of light and playing with distance and angle of light – using the standard zoom reflector. XPOSURE 2016 will continue to host such educational sessions headlined by leading photographers and industry experts through the duration of the event.